Traffic around town was chaotic yesterday with the FT parade rehearsals that we kept changing our minds on where to go. 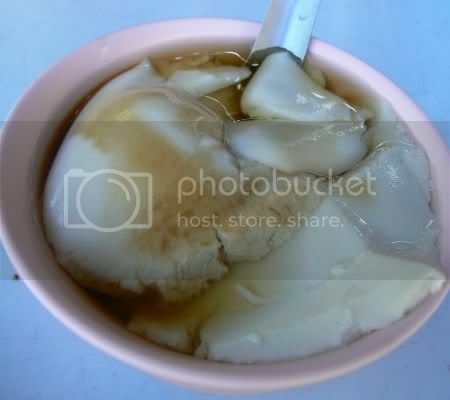 Eventually we ended up at Jalan Peel hence it was yong tau foo this time round. Just off the main road, Jalan Peel almost at the end before the turn off to Jusco Maluri, you will see this road, Lorong Peel with signboards to a government school called Yaacob Latif. You can't miss this wooden shack on the left hand side of the road which has been in business for almost ten years plus. Sandwiched between a hardware shop (whereby the owner couldn't stop staring at me when I snapped pictures) and a beauty salon, this place came highly recommended from my friends. 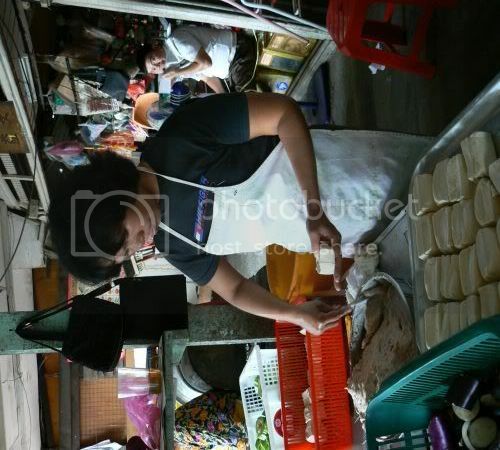 Everything is made on the spot and you'll see various people doing their part by stuffing the prepared fish paste into the vegetables. In fact, everyone is so super busy that they didn't bother when I continued snapping pictures. 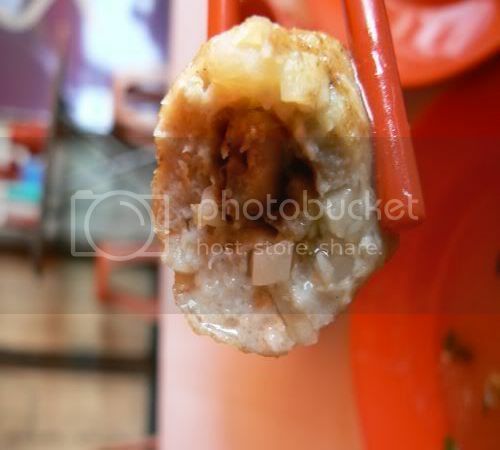 The fish paste is mixed with minced pork to give it a sweet flavour. 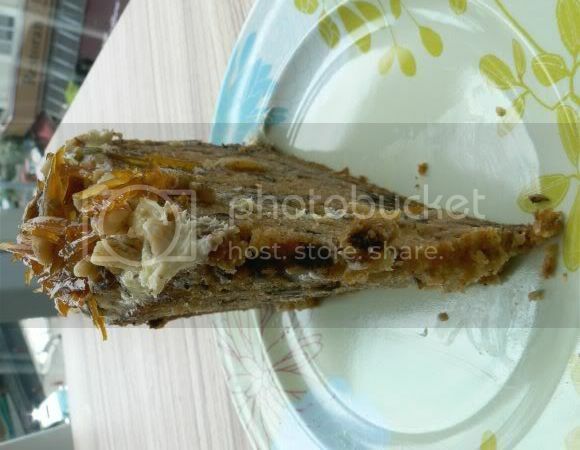 Usually the Hakka variety has salted fish added also but the taste of it is not so distinct here. Some Hakkas get really fussy even about what type of pork you must add as it has to be the soft minced pork belly to get the right texture. A quick call to a friend of mine indicated what were the must haves from the menu. Here they'll give you a piece of paper with all their items which you tick and indicate the quantity you wish to order. It's a good system as I've seen some stalls adopting the pick what you want at the counter system which just clogs up the counter. We liked the smooth tofu here and the crispy bean curd. Another plus point about this place is everything is freshly fried. We also liked the braised oyster special which looks pretty ordinary from the outside but hides crunchy yam bean and delicious dried oyster within it's interior. You can order rice with your yong tau foo as they also serve a variety of dishes such as black vinegar pork leg, assam fish, chicken curry and etc. My friend recommended the Hakka Char Yoke. 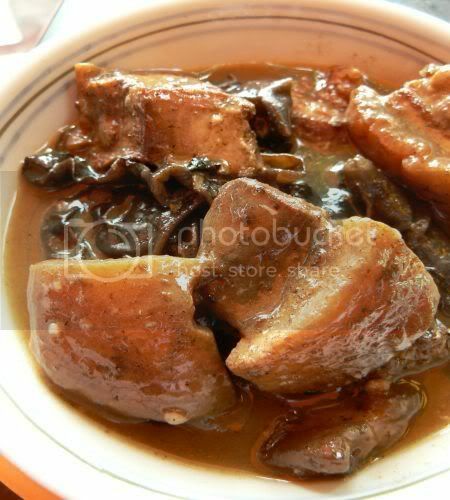 The pork belly slices are marinated with fermented bean curd (nam yue) and then deep fried till crispy. Sometimes if you frequent the economy rice stalls, you can see these fried bits which they also sell. The meat is then braised with the nam yue and wood ear fungus till it's tender. The taste of nam yue is not very strong with this dish but we liked the thick gravy it came with. 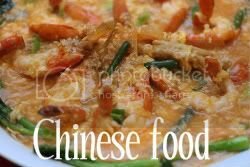 Besides these items we ordered, you can also get fried wantan, spring roll, fried bean curd stuffed with fish paste and braised mushroom special, stuffed chili and etc. I guess Blogger wasn't going to take any hemming and hawing from me anymore as I had no choice when I tried to log in just now. Kinda good too as most of the feedbacks I got from all of you have been positive. Hopefully nothing goes wrong with the blog as this week hasn't been too perfect either. Since I had to wait for someone in Bangsar yesterday, I decided to check out the new shopping centre there i.e Bangsar Village II which just opened their doors last week. Although most of the shops have yet to open, the ones which have started business look really good and perfect for any retail therapy I need. Rather than rant and rave about shopping which I'm sure all of you will roll your eyes upwards, I decided to check out the food scene there. Most of the places are repeats of whatever you get in the original Bangsar Village i.e. Bakerzin, delicious by Ms. Read (yet to open) and Starbucks. Coffee Bean and Tea Leaf has closed their outlet near Hong Leong Bank Berhad and moved in here instead. There was one surprise addition - Marmalade Cafe upstairs. They just opened for business on Monday and it was pretty packed with people. I liked the decor of the sunny cafe: with bright colours and glass windows that look down to Devi's Corner. It's also nice and spacey which I prefer versus to the Mont Kiara outlet that was slightly too claustrophobic for me. For those who prefer the Mont Kiara place, don't worry as this is a branch. Menuwise, the old favourites are all there including the Carrot Cake I had but with additional items on their breakfast menu. They also have a cute boutique they own next door called Kitsch. Should I switch to the New Blogger template? I think my blog is acting up because I have yet to switch over to the new template. Now Blogger has taken one step to just ask me to convert when I log in. In fact, if I didn't look carefully I would have been automatically converted. Since I'm old school when it comes to IT related issues (something which baffles a lot of friends since I have a technically inclined other half), I have been resisting the conversion so far. Anyway, I'll put it up to all of you whether I should convert or not as I think quite a number of you have experienced the conversion? Should I go over to the dark side as that will give me the ultimate power and faster access speed? Do tell and I'll work on the conversion ASAP. Sorry for the Star Wars references as I have been watching the repeats during the festive season. Since we were in Batu Pahat on Saturday, Nasi Briyani or Nasi Bariani as how the locals spell it was the obvious choice. It's been ages since I visited Batu Pahat hence I was totally lost. Only vague memories I had was my dad taking us to eat at a place near the hospital. Luckily, the Rotarian whom we earlier met lead us to this particular place near their office. His first suggestion was Power Bariani which is further away but he took us to this one since it would have been a long journey with traffic. This place has been featured by the local cuisine show, Jalan Jalan Cari Makan as they received a plaque from them which is proudly displayed in the restaurant. After chatting with them, I found out they're somewhat related to the Bariani Power House located in Section 13, Shah Alam which we had at Subang Jaya's Ramadan Bazaar. No wonder the food looked similar as they use large steamers on slow fire to keep the rice warm, coloured rice for decoration and a topping of raisins. I must admit my tastebuds this time was biased as I was super hungry and this was my first proper meal of the day. Meals during the whole day was just half boiled eggs, coffee and kaya toast which we had at Lenga town. However it tasted really good to our hungry tummies. The lamb which I had was tender and fragrant with spices. The rice I felt was not as fluffy and fragrant compared to the nasi briyani sold at the Taman Tun Dr Ismail Ramadan Bazaar. Maybe it could be because it was cooked much earlier during the day since they have been opened for the whole day. Since there was such a big group of us eating there, we helped the restaurant finish up their food for the day. Thanks to the Buaya group as they picked up the tab for the meal. If you wish to try their food, there are plans to open up another outlet in Johor Bahru. 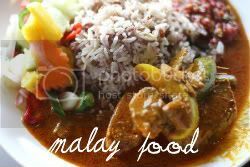 Alternatively head to their friend's place in Section 13, Shah Alam which serves the same type of Nasi Beriani using a similar recipe. Yesterday, after a rendezvous at Seremban's R&R Stop, we headed down south for the first of our trips to carry supplies to the flood victims. A total of eight 4WDs went down whereby most of them were either from the Lanun Darat or Buaya groups. 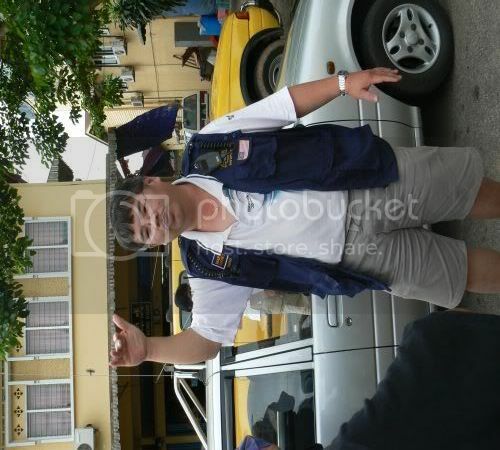 Earl Ku from Kukujiao who heard about the trip through Babe in the City-KL also joined us. Each vehicle was carrying various items collected from kind people such as rice, cooking oil, canned food, clothing, milk powder, school bags, children's toys and etc. 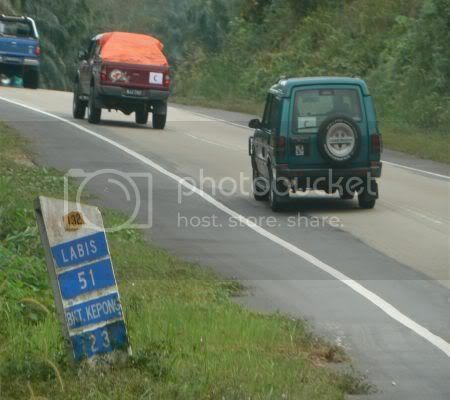 We chose to head out to Lenga town, just off from the Pagoh exit after discussions with the local contacts and the district welfare officer instead of the earlier mentioned Sri Medan town. On the way there, you can see marks of the flood based on the muddy tracks left. Some parts of the town was luckily not affected like the shops as it was located on higher ground. After a briefing from the local contact, Choy who advised us two areas to concentrate on i.e the Malay village of Kampung Sungai Berani and the Chinese village at the other side of the town centre. While we were waiting around the shops for the briefing, I couldn't resist snapping pictures of these cute kids at the local sundry shop. They were very enthusiastic when I started taking their pictures especially the jovial little boy. The town is the typical one row of shophouses type located just opposite the local police station with a mix of: sundry shops, a motorbike repair shop, a furniture shop, a rubber sap collecting centre and a hardware shop. Surprisingly there's no proper restaurant here as the only place opened was just serving snacks and refreshments to the locals. The policemen were kind enough to let us park at the back of their police station to repack and sort out items among each of the cars. 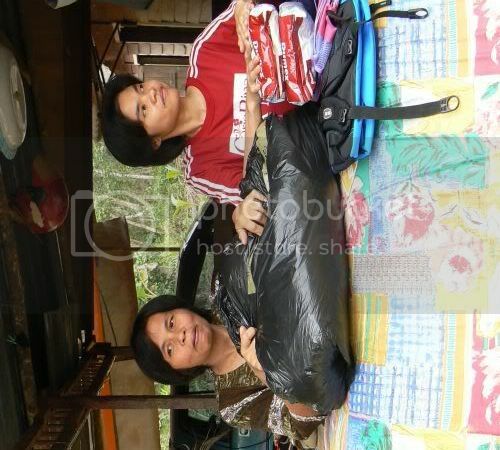 This was to ensure an equal distribution of the items needed by the victims. We headed towards Kampung Sungai Berani which faces the river banks of Sungai Muar ( I think it's Sungai Muar but I could be very wrong, so this may be amended). 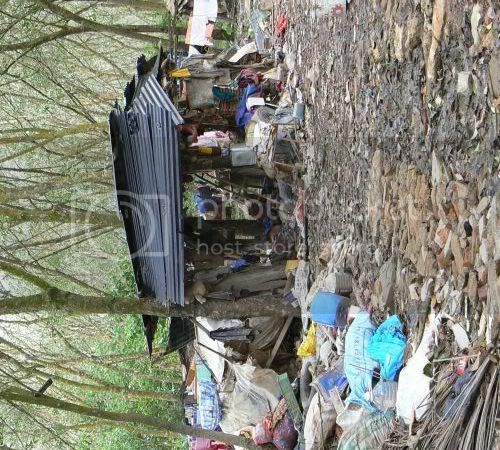 Along the road leading into the village, you see houses affected by the flood. Although most of them are back in the homes from the relief centres, they're still clearing out items and drying them out. You'll see them hanging out clothes to dry, ruined items discarded on the side, mattresses hung out to air and sofas completly ruined from the flood. The floodwaters reached up to almost the top of their roof which made it virtually impossible for them to stay in their houses so they were relocated to the local mosque. 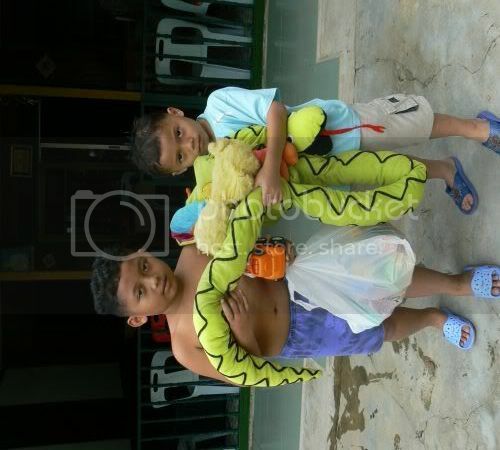 Whenever we saw kids, we gave them toys, schoolbags and clothes to help them out. Initially, they were stunned to receive the items but later on when you pass by their houses, you can hear them playing with the toys. One little girl, opened the plastic bag of toys and her small little face lit up when she saw what was inside. At the Chinese village just before the town centre, you get a mix of wooden houses and brick houses within an area which were affected by the flood also as they're located in the low area (Lenga town is in a valley). Although we delivered staple food items to their parents, the kids were the happiest with their toys and schoolbags. One of these kids was really taken by the white teddy bear she received as we saw her later running to another house to show her friend what she got. Here, most of the houses have cleared up the debris and the inside of their houses. Some are still drying out their sofas and cleaning the inside from mud. See the slightly faint mark on the wooden house's front wall, that was how high the water level got. Some of them like this lady was repainting everything in their house in preparation for Chinese New Year which is to be celebrated in February. After Lenga town, we headed towards Batu Pahat whereby we met the Rotarians whom we passed the remainder of the items to deliver to other affected areas. Getting all those items up the stairs to their first floor office was a herculean effort but made easier with lots of teamwork. A quick chat with them indicates that there some areas still under flood waters around the town but coordination for the relief effort is poorly organised resulting in delays or wasted efforts. I guess next week, we'll have more stories on what's happening down south since another trip is planned for the weekend. Luckily I conquered my slight fear of souffles when I tried them out for the first time in IMBB 20 as the new Donna Day's theme by running with tweezers is all about souffles. Knowing how difficult it is in getting the perfect souffle (I had to attempt it four times before I got one which I was satisfied with the last time), I was all out for the simplest recipes. Sometime back, I picked up the cookbook, Off Duty which featured the world's greatest chefs and what they cooked at home. I was attracted to one recipe in it - the adorable Egg Souffles made by Michel Richard who runs Citronelle, a restaurant in Washington DC. It was perfect for me as it was whimsy, fun and simple to make. 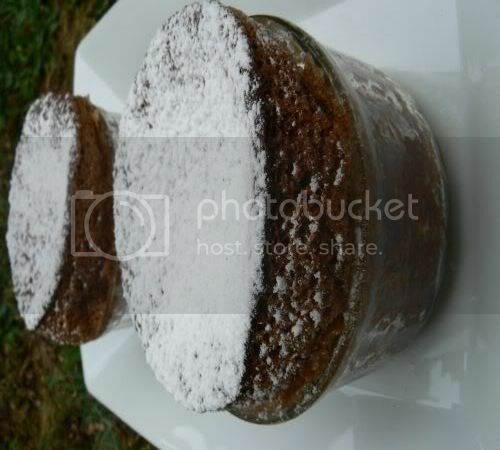 In fact, this time round my souffle efforts were all a breeze. In this recipe (seen below), the egg souffle is a clever mix of yellow lemon curd for the yolk and snowy white meringue as the egg white. Incredibly simple to recreate, it's served in an egg tray you usually pick up from the egg seller at the wet market. I loved the taste of it since I like tangy lemon curd and light meringue. Seeing my first effort wasn't much of the traditional souffle, I decided to play safe and make another one from the same cookbook. 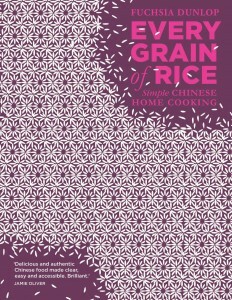 This time round, the recipe was from Alain Roux, famous for his work in Waterside Inn with his father, Michel Roux. Again this was slightly unconventional as it uses Toblerone chocolate. Easily available in any supermarket, Toblerone represents all the fun things in life for me. I love the triangular shape of the chocolate that spells it's name on the side and the chewy almond nougat bits. My souffles puffed up tremedously after a short stint in the oven making it look slightly like mushrooms with huge brown caps. Taste wise it was yummy and I probably should have added additional nougat pieces inside it as the ones in the chocolate melted when I heated it up. Do give these a try especially the fun looking Egg Souffles. There's definitely a wow factor to it but make sure people like lemon curd as it's not something everyone likes. For instance, Splashie Boy my chief taster hates it. Check in at Running with Tweezers as we'll be voting for the best souffle from the event after she posts the round up on February 3rd. Using an egg cutter or a very sharp knife (I used my Global knife), cut the tops of the eggs carefully. Discard the tops, keeping only the bottom of the egg shell for presentation. Seperate the yolks and whites of 4 eggs. The remaining 4 eggs can be used for an omelette. Make the lemon curd by placing the egg yolks, 100 grams caster sugar, lemon juice and unsalted butter in a microwave safe bowl. Microwave it for 5 minutes, pulling it out every minute to whisk it. Cover with cling film and leave it to cool. It will thicken when it cools. You can make this one day ahead and keep it in the fridge. Whisk the egg whites, adding half of the remaining sugar little by little until they form soft peaks. Fold in remaining sugar with a spatula. 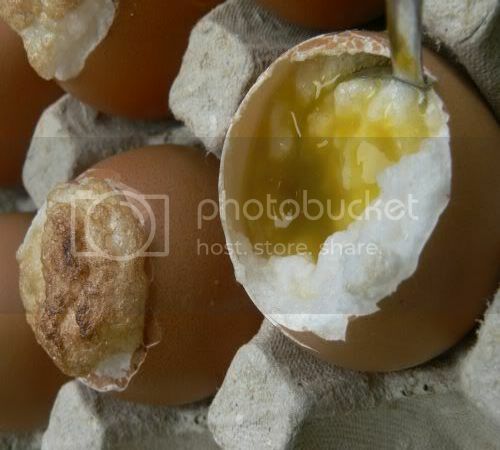 Place 8 eggshells in eggcups (or the eggtray). Put meringue in a piping bag and half fill the shell with meringue. Spoon the lemon curd in another piping bag and pipe about a teaspoonful into each eggshell. Add more meringue on top to make it look like a souffle. Place in microwave for 5 seconds. If you have a blowtorch, use it to brown the tops or like me, put it under a hot grill for a few seconds. Brush insides of four 8 cm ramekins with softened butter. Put 30 grams caster sugar in one of the ramekins and coat thoroughly. Tip excess sugar into next ramekin until all are coated with butter and sugar. Put 140 grams of the Toblerone in a bowl and place it over a pan of simmering water, making sure the water isn't touching the base of the bowl. When it has melted, remove from the heat and stir in the flour. Beat egg whites with 75 grams of the caster sugar until they form semi firm peaks. Using a whisk, mix one third of the whites in the melted Toblerone, then delicately fold in the rest with a spatula. Scatter remaining chopped Toblerone over surface and mix gently. Divide mixture and smooth surface with palette knife. Place on baking tray and bake for 10 to 12 minutes in oven preheated to 200C. Serve immediately. This weekend, it's time to come out with the bare truth about my kitty aka Fluff Puff. Although we always think of her as the baby of the family, I found out the ugly truth recently behind that innocent furry face. We have been getting a spate of birds being killed and left around the house. Now, since I couldn't pinpoint which cat it was, I always assumed it was Fluff Puff's mother since I know she hunts mice once in a while. However to my horror, I discovered that the "birdy killer" was none other than my Fluff Puff when I caught her in the act. Ever since then, the birds are all wary of her. I guess they're also to blame as sometimes they steal her dry food which I lay out for her hence Fluff Puff thinks it's fair justice. For more kitty stories, check out Bustopher and Harmon at Kate in the Kitchen who's hosting WCB this weekend. I also heard there's a big party there complete with treats and you need to dress up a bit to attend. If you really love Italian food and ingredients, a must do for this weekend is dining at Prego @ the Westin Hotel who has a visiting celebrity chef and famous cookbook author, Faith Willinger. She's also running a cooking class on Saturday but I heard it's fully booked already. I had the opportunity to try her food last night at dinner with friends and the food really blew us away. She's brought in quite a lot of ingredients directly from Italy which makes the difference as her food is simple and showcases the wonderful ingredients. 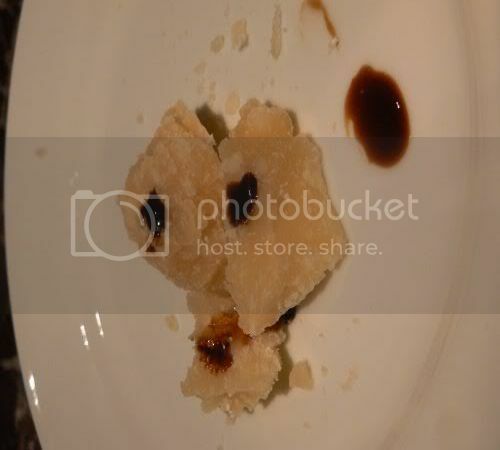 For instance, take the simple Amuse Boche she served - Fettunta with Castello di Ama. Served with excellent extra virgin olive oil, it tastes fantastic. 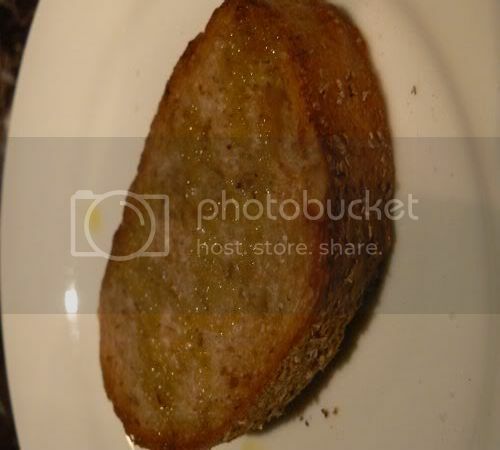 Even something as simple as Aged Parmigiano Reggiano was delicious on it's own with it's slightly fruity flavours. Served with precious few drops of twenty five year old aged balsamic vinegar from Modena that is syrupy and woody, it's sublime. Incidentally, Faith Willinger goes around from table to table to serve the balsamic vinegar, so you can ask her more about the heavenly balsamic vinegar. According to her, it's aged in 5 types of different wooden barrels in an attic in Italy. Depending on the age of the wooden barrels and the types of wood they use, the balsamic vineger will absorb the flavours. I really liked the delicate flavours of the Crudo di Pesco - Raw Marinated Yellowtail with Wild Fennel Pollen and Fennel Carpaccio. The highly sought after wild fennel pollen is collected from the flowers of wild fennel which is subequently dried and used like a spice. Next course was the Spaghetti alla Gricia con Tonno - Spaghetti served with garlic pepper brined tuna. 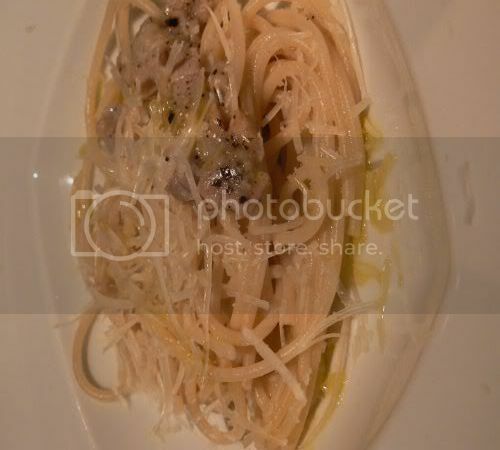 Also a simple dish, you'll enjoy the al dente spaghetti, tossed with the salty tuna and pecorino romano. 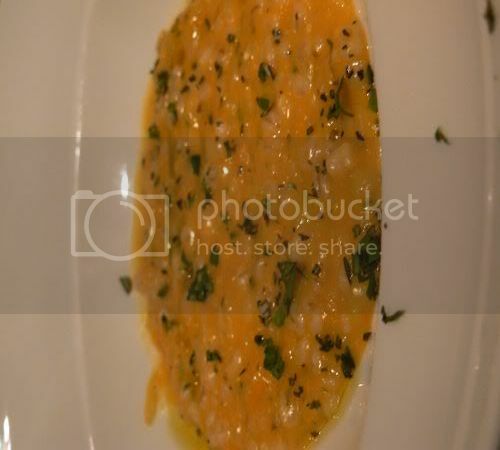 I absolutely love this, the Orzotto Barley Risotto made with pumpkin, leeks and barley. It's creamy yet delicate. The extra virgin oil they used brings out the sweet flavours of the pumpkin making this ultimate comfort food. 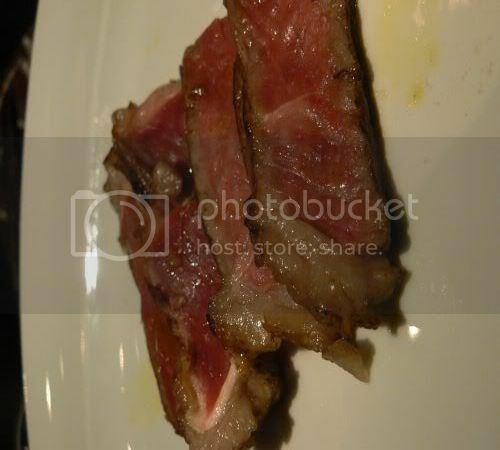 There's a choice of two main courses for the set: the Bistecca alla Florentine which is Prime T-Bone Steak served with extra virgin olive oil. My friend had this and it was yummy as she shared a slice with me. The extra virgin olive oil makes everything taste better once you drizzle it on. One sticky issue about it was it still had some chewy tendons not removed when they served it. 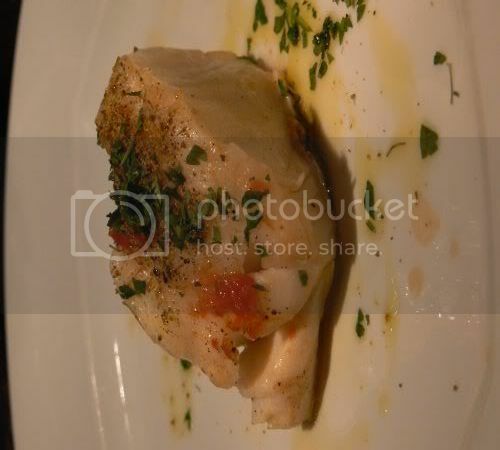 I had the Merluzzo in Acqua Pazza - Black Cod Poached in Crazy Water which was very good too. Crazy water refers to the poaching liquid used by the Italians for the fish that is prepared with tomatoes and herbs to infuse it with flavours. 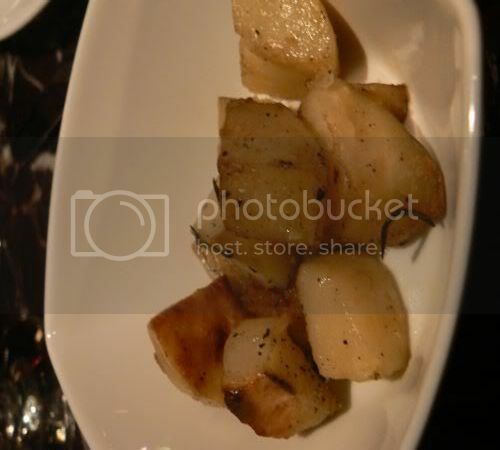 For sides, they served wood fire roasted potatoes. Parboiled before hand, they're roasted in a wood fire oven for the crisp exterior. 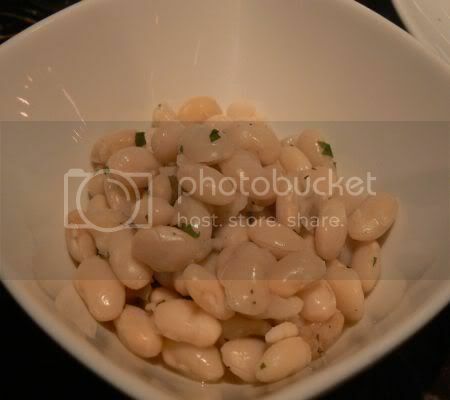 They also served us creamy cannellini beans tossed with sage leaves. 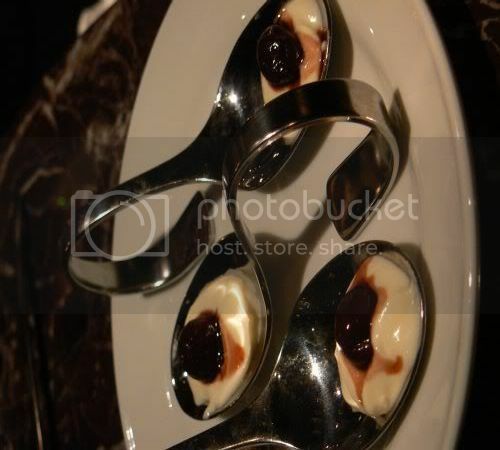 For desserts, there was the yoghurt served with sour cherry. The yoghurt is beautifully rich and complemented with the slightly sour cherry. 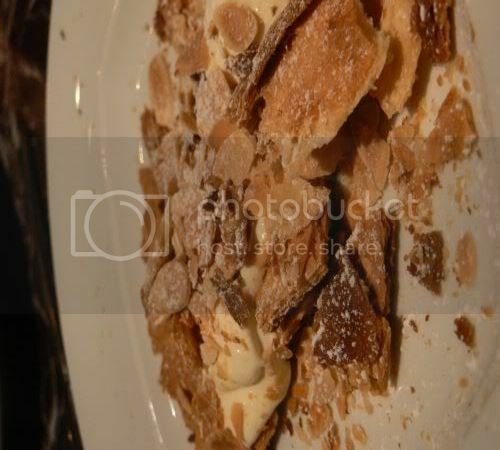 We also had the deconstructed MilleFoglie which looked like a mess but tasted so good. The flaky crunchy pastry bits combined with toasted almonds and the chantilly cream was excellent. Although it was rich with cream, it was a great way to round up a light and satisfying meal. We also had lots of wine to drink that was paired with the food. However, there was a slight mix up with the wine served somewhere in the middle of the courses and one of the red wines tasted too acidic. At the end of the meal, you are also served Grappa specially brought in from Italy. Initially we didn't know how to enjoy the Grappa until we got a small lesson on how it was made. To taste the flavours, dip a finger into your grappa and dab it on your skin, the alcohol will evaporate allowing you to smell it. Here the grappa tastes slightly woody as they use woody stems and leaves to make it during the distilling process. Not only did we get an opportunity to taste great Italian food and ingredients, we also spent some time chatting at the end of the dinner with Faith Willinger and her friendly team of people namely Jennifer and Tomas who's family owns the vineyard which produces the Grappa. So what are you waiting, go call for a booking tonight or tomorrow night. For the subsequent nights, you can choose from the a la carte menu that offers these dishes and more. Whatever it is, you won't be dissapointed. My friends who ate with me love her food so much, they're revisiting the place tonight and tomorrow night with other friends while another friend is eating at the Sunday brunch where her dishes will also be featured. Sadly, I can't follow as I'll be going down to Johor this weekend but hopefully my friend, S will snap lots of great pictures for the cooking class and dinner. How appropriate that I'm blogging about Swedish food today as I just watched Anthony Bourdain's No Reservations episode on Sweden. Unfortunately I followed it up with Nigella Lawson's Feasts and she was doing her chocolate temptations and boy, did I feel like eating something chocolately straight away. Aargh! Not a great idea after midnight to start craving for chocolate. This little known place which has been overshadowed by Ikea isn't a place I usually go all the time as parking is virtually impossible around Damansara Uptown during weekdays unless you break the rules by double or triple parking. However the MBPJ officers are always vigilant around the area issuing clamps and fines. You do have the option of parking inside the Uptown offices but I tend to avoid their carpark as it's kinda dark since the visitor parking is at the lowest level. This place serves pizza, pasta and Swedish specialties in a simple cafe environment. Really no frills type of place so don't expect much in terms of decor. I tend to prefer their Swedish meatballs (you can either order beef or chicken -RM13.80) here as they taste very home made. Another plus point is they serve it with mash versus boiled potatoes which I reckon is a better fit with meatballs especially with lots of sauce. Although I've not tried many other choices as it's always been just meatballs for me, they also serve lots of fish dishes but don't worry, there's no exploding fermented herrings here. 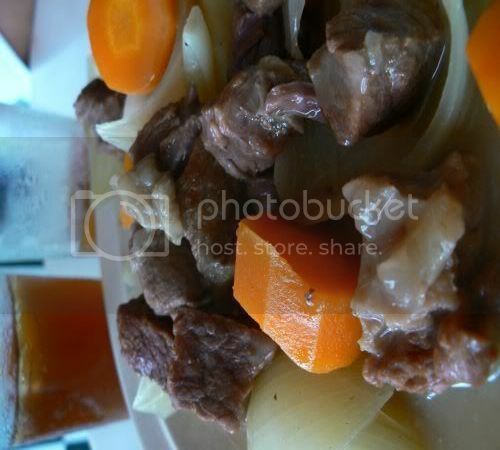 Splashie Boy had the conventional Kalops (RM13.80), Swedish beef stew with potatoes, carrots and onions. Not sure what's the Swedish element in it as it tasted just like an ordinary comforting beef stew with a generous portion of tender beef cubes. If you strike lucky with a parking space, drop by this place for a comforting meal. If not, try them during the weekends when parking is not as hectic. And don't worry, they don't play any ABBA music which you will feel like axing just like what Anthony Bourdain did in No Reservations. One of my favourite places to indulge in hearty Italian food with my friends is Neroteca located at the Somerset Residences at Lorong Ceylon. It's a small place and during weekends, if you don't book a table, expect to be dissapointed. Don't expect it to be a quiet place too as it's a place to hang out with friends and sometimes if you sit near the kitchen, you can even hear the chefs banging on the pots and pans. I like the way how they have decorated the place with ceiling to floor racks filled with Italian ingredients ( we sat next to the tuna cans) and the hanging sausages just above the bar area. (For pictures, check the link to their website) My friends who have visited Nerovivo, their sister outlet claims the food especially the pastas here are much nicer. However, they're non halal as most of their dishes have either bacon, parma ham or pork in it. I've had the opportunity to eat lunch and dinner here a few times. As usual, pictures during daytime is always great versus my night ones as it was pretty dim there. I had a lot of trouble trying to snap a picture of my lunch as they do this lunch special known as Menu Fisso which is served on an enormous plate. You pick a choice of fish or beef which is served with pasta or salad that changes on a daily basis during weekdays. For my lunch special, I had the braised snapper with salad and grilled polenta. The sauce which the fish comes in delicious that I was mopping it all up with my polenta. Simply yummy especially with the fresh basil leaves on top of it. We have tried quite a few items from their menu and so far, their salads are excellent. 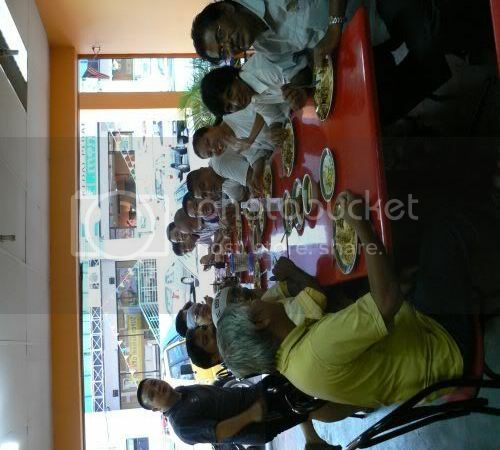 I know we have ordered their Neroteca Salad(RM29) and the Pietmonese Salad(RM22) which were equally good. Both of the salads come chock full of ingredients so share them with your friends to leave room for other goodies. Another starter we tried was their Prosciutto e Melone (RM29) i.e. 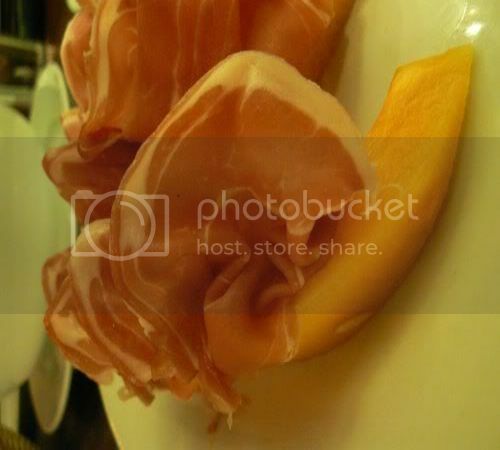 thinly sliced parma ham which complements the sweet rock melon. Sometimes they run special promotions depending on seasonal ingredients. 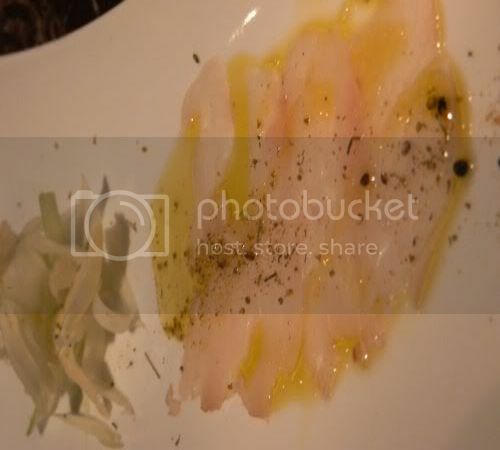 One time we ate there, they had a white truffle special which you can choose an item for it to be served with. We all shared a simple omelette made with garlic, herbs and parmesan cheese since we thought that will be an excellent way to enjoy the truffle. We weren't too impressed with the truffle but the omelette was superb. That definitely should be a permanent item in their menu as it was utterly delicious. Pastas here are also very good. 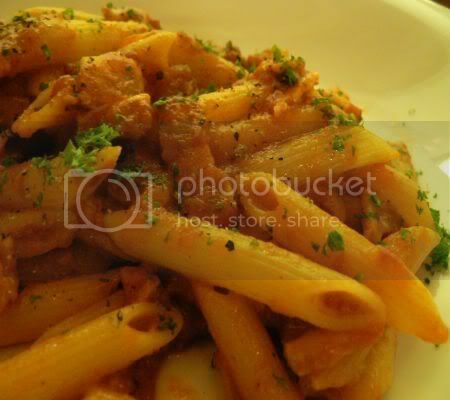 The picture above shows the Bucatini (RM22) which is served with amatriciana i.e. a tomato based sauce, onion and bacon which my friend ate. We have also tried their Tagliatelle Carbonara (RM22), the Tagliatelle Boscaiola (RM22) and the Linguine with pesto and prawns (RM24). The pesto one wasn't that fantastic but I like the Tagliatelle Boscaiola which comes with sausages, mushrooms and rocket leaves in a cream sauce. 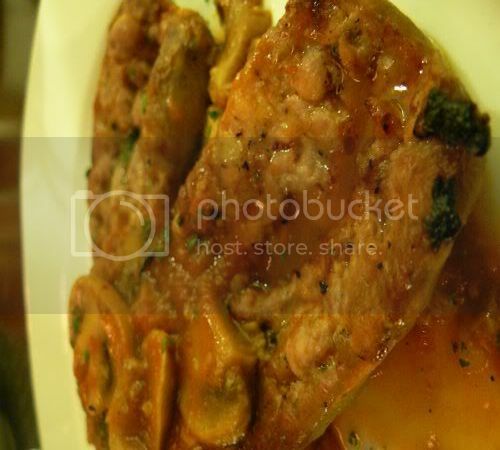 For one of the dinners, I had their Salsiccia (RM36) which is their home made sausages on grill polenta and mushroom sauce. Unlike other sausages, their version is air dried hence it's chewy so this may take time to get used to since we usually associate sausages differently. Their dessert selection is not too impressive but stay for their coffee which is good. We have on one occasion ordered their Chocolate Cake which looked impressive but didn't taste as good as it looked. Do give the place a try especially with a group of friends as it's a great place to hang out and chit chat. Continuing my exploration of the stalls behind Yut Kee, I took Babe in the City - KL's suggestion to try the Char Kuey Teow. The stall is manned by a father daughter team but the daughter is the one who's doing the frying at the huge cast iron wok. 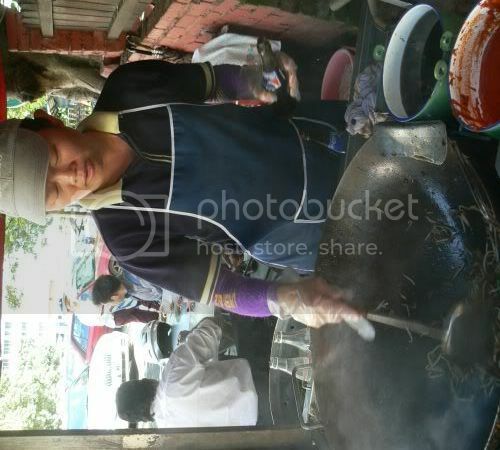 It's interesting to observe the whole frying process which was easy since I sat at a table near their stall. She's got all the ingredients laid around the wok for easy access: chopped garlic, chilli sauce in one green pot, eggs, bean sprouts in a metal container next to her and etc. 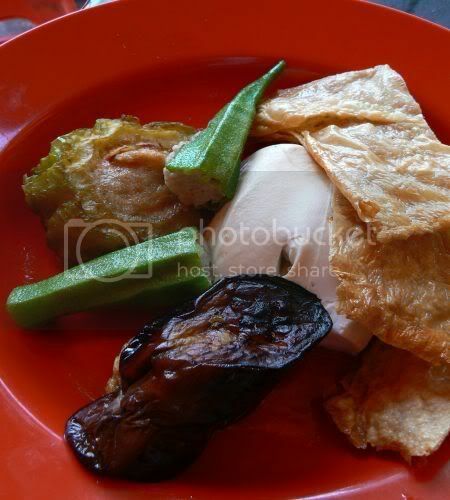 If you see the green pot just above the chilli sauce, beneath the murky darkness lies decadent fried lard pieces which is added into the char kuey teow for oomph! One little technique I observed her using was her continued shaking and holding recycled Pepsi glass bottles containing her seasonings - dark soy sauce or light soy sauce. If not in use, they're hung right in front of the wok for easy access. 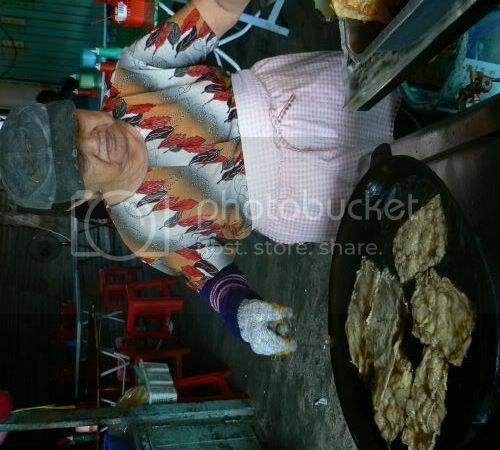 As the wok is deep and huge, she uses a big, flat and wide steel spatula to spoon the fried char kuey teow into plates. 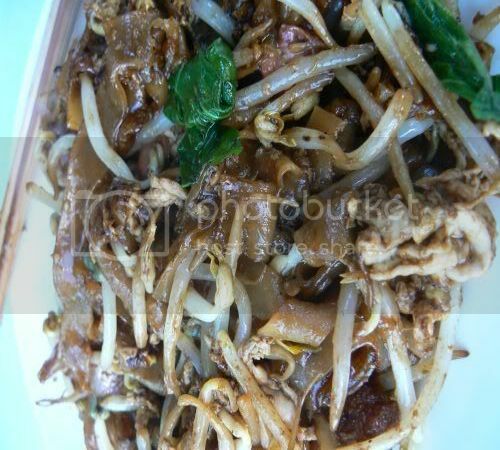 Tastewise, my char kuey teow (RM3.50) was yummy and since it was the Kuala Lumpur version, this type uses more dark soy sauce and is not as dry compared to the Penang style. There's a generous portion of bean sprouts mixed with egg plus my barely cooked cockles. Nestled in between the dark noodles, you'll also find crunchy pieces of fried lard. For dessert, you can order it from the man running the soya bean stall - try the Michael Jackson, a Malaysian concoction of soya bean milk and cincau (grass jelly) strips (RM1) or the smooth soya bean curd (Tau Foo Far - RM0.70) which comes with a gula melaka syrup tinged with ginger that is refreshing. I'm sure you know of the sad situation in Johor where thousands of families are displaced because of the flood situation. One of the 4x4 groups we hang out with a.k.a the Buayas have organised their own flood relief. 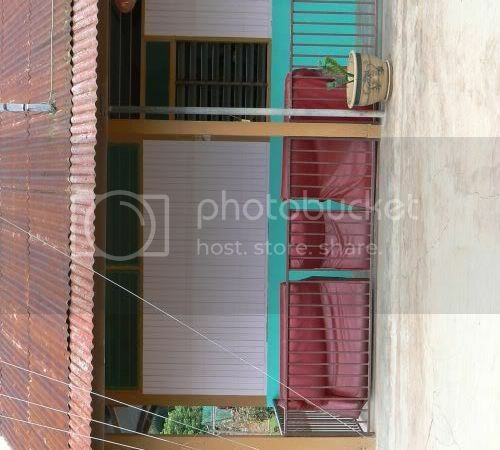 A team was sent down last weekend to recce the place namely Sri Medan, a small town near Yong Peng as advised by the Malaysian Red Crescent Society. As of yesterday, the village is still under almost 3 feet of water and the people have been evacuated to relief centres. It's been a while since I participated in food events that my cooking plus baking skills have gotten really rusty. As a promise to myself, I plan to take part more regularly in food events this year. Starting up my resolutions is one of my favourite events, Sugar High Friday. Although it's not Friday today, due to the deadlines I have decided to post this on Monday. This time round, David Lebovitz has chosen Chocolate by Brand as a theme where you make a chocolate dessert and explain what brand of chocolate is used. Personally I have gotten kinda "chocolate shy" since my last fiasco when people didn't like my taste for Valrhona's bittersweet chocolate. Hence this time round, I decided to take my friend's advise and purchase this German chocolate known as Mohrenglanz from a bake shop called Guten Braun. The bake shop buys it in bulk which they cut in 500 gram bars. It makes perfect sense also to experiment with this chocolate since it's cheaper (RM17 for 500 grams) than Valrhona which I guess will be reserved for both of us since we prefer our chocolate more bitter. I wanted something special for the event hence I settled for a Chocolate Crepe Cake. Based on the Mille Crepe which has been taking Malaysians by storm at a little cafe called Food Foundry, my search on the Internet revealed a few sources. Although I was keen to try Delicious magazine's recipe which I have, I decided to experiment further by using a different filling. Martha Stewart's version looked inviting and too sweet with the hazelnut meringue. Moreover, there has been many attempts to recreate this which has been documented on the Net. Then I found Amanda Hesser's tribute on the New York Times to Lady M's Mille Crepes which started this craze and she suggested Pierre Herme's Vanilla Pastry Cream. Since I have Chocolate Desserts by Pierre Herme on my bookshelf, I decided to use his recipe for chocolate pastry cream instead. Like Amanda Hesser's suggested recipe, I added whipped cream at the end to soften the pastry cream. Use a light frying pan to make your crepes. Doesn't need to be a special flat crepe pan or anything expensive. I used a smaller one (18 cm) which was easier for me to turn my crepes. Melted butter was used to coat the pan. The first crepe is always an experiment so I use it to absorb most of the melted butter. If there's excess, remove it with a tissue. For each crepe, I usually remove it from the fire when I pour the batter, swirl it around till I get a thin layer and pour it back to the jug with the batter. It creates a tail at the side of the pan, which I will cut out to make the crepe a round shape. I find if I add the batter when it's on the hob, it gets too hot and the crepe sets too fast. I usually cool down my frying pan by placing it on a wet tea towel at the side. Remember to not cool the pan too much or else when you swirl the batter, it won't stick to the pan. You'll find as you keep making them, your crepes get better and better. You need to ensure each layer of pastry cream is even. I made a mistake of adding too much hence my crepe cake was slightly tilting to one side. Although Pierre Herme's chocolate pastry cream recipe seemed complicated, it wasn't and it was easy to make for a first timer. All it did was create a lot of saucepans for me to wash though. Hope you'll give the crepe cake a try one day. It was quite time consuming task but a show stopper when I brought it over to Splashie Boy's Sunday family dinner. The thought of so much chocolate pastry cream can be daunting but the texture is nice and light akin to a chocolate mousse. Although I was initially worried about using the Mohrenglanz chocolate instead of my usual Droste or Valrhona, I was quite happy on how it turned out. Since I still have a large block of chocolate, I'll be experimenting with it more in cakes and cookies. Mix flour, sugar, eggs, yolks and milk in a blender or food processor until smooth, then pour into a jug and stand for 30 minutes. Just before cooking, stir 40g (2 tbsp) melted butter through the batter. Heat pan and brush with extra butter, add enough batter to coat base, swirl to cover, tip off any excess. Cook for 45 seconds, then flip and cook for 30 seconds more or until golden. Repeat with butter and remaining batter till you get abt 20 crepes, stacking with baking paper in between. Fill a large bowl with ice and set aside a small bowl that can hold the finished pastry cream and be placed in this ice bath. Set aside a fine meshed strainer too. In a small saucepan, bring the milk to the boil. Meanwhile, whisk the yolks, sugar and cornstarch together in a heavy bottomed medium saucepan. Whisking all the while, very slowly drizzle a quarter of the hot milk into the yolks. Still whisking, pour the rest of the liquid in a seady stream into the tempered yolks. Strain the mixture into the saucepan, place pan over medium heat and whisking vigorously and without stop bring micture to the boil. Keep the mixture at the boil, whisking energetically for 1 to 2 minutes. Still over heat, stir in the melted chocolate, then remove the pan from the heat and scrape the pastry cream into the small bowl. Set the bowl in the ice bath and stir until the temperature reaches 140 degrees on an instant-read thermometer. Remove cream from water bath and stir in the butter in three to four additions. Return cream to the ice water bath and keep it there, stirring ocassionally until completely cool. Whip heavy cream (I used one small carton rather than 2 cups as mentioned in Amanda Hesser's recipe) and fold it into the pastry cream. 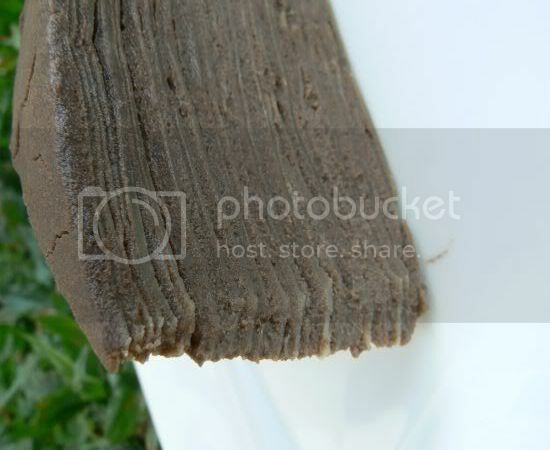 Lay one crepe on a cake plate. Using an icing spatula, completely cover with a thin layer of pastry cream. Cover with a crepe and repeat to make a stack of twenty, with the best-looking crepe on top. You can either sprinkle sugar on the top crepe and use a blowtorch to caramelize it or sift icing sugar on top. For my crepe cake, since I had excess pastry cream, I iced the sides and top just like a cake. Chill in the fridge until time to serve, cut into slices and serve. Since I did my rounds this week, I stumbled on a stray cat who was hanging out at the stalls looking for handouts. This little tabby who looks exactly like my Kits was persistently meowing away at me throughout my meal at the stalls right behind Yut Kee. Since I didn't think kitties should be eating char kuey teow, I stopped by to get it a nice piece of steamed fish from the chap fan (economy rice) stall. Needless to say, it was in seventh heaven after it's fishy meal. 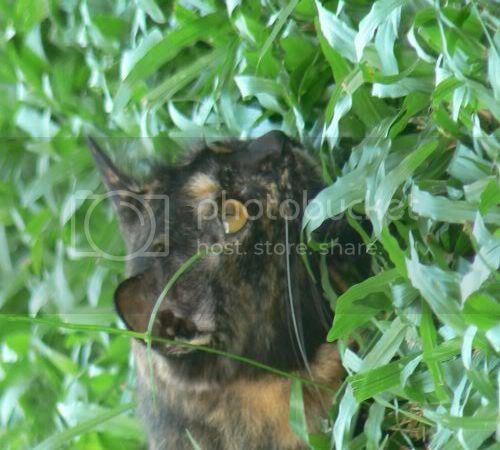 For more kitties, do check the Cat's Blogosphere who's hosting WCB this weekend. 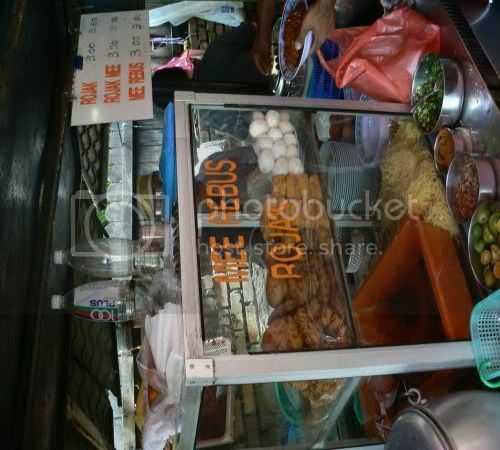 Recently, I have been exploring the stalls right behind Yut Kee Restaurant and next to Bodhi Tree Restaurant after reading about them on Babe in the City - KL's blog. 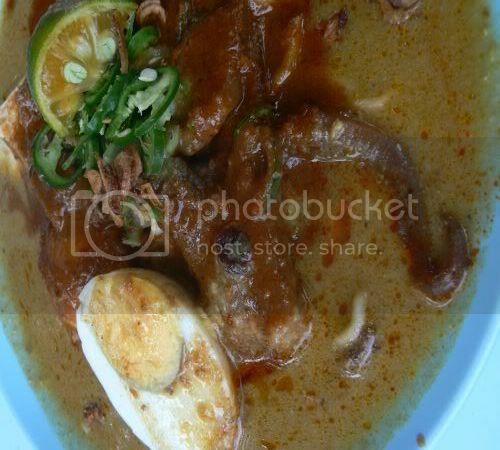 Although my main aim was to try her recommended favourites which I will blog about next week, during one of my visits there, I noticed quite a few people ordering the Mee Rebus. The place is quite famous as it's been featured in New Straits Times and the monthly KL Lifestyle magazine. One day, I saw one of the customers eating this which looked interesting - Mee Rebus campur Rojak Sotong (RM3.50) hence I decided to give it a try. Although the bowl comes with lots more items versus Rosli Mee Rebus with one hard boiled egg, brown sotong, slices of tofu, potato chunks and chopped green chillies, the gravy was not so flavourful. 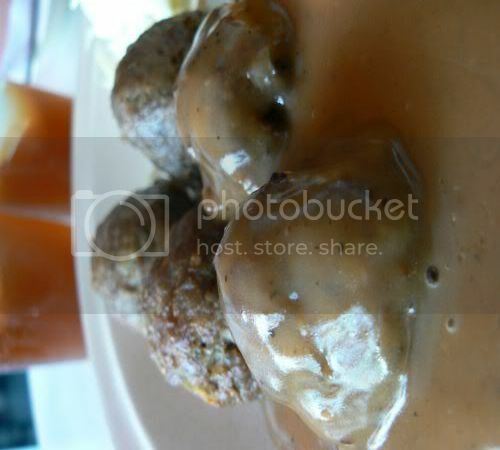 I suspect their beef stock is not so robust and the colour of the gravy looks like there's more sweet potatoes here. However it makes really nice comfort food that you can slurp down. 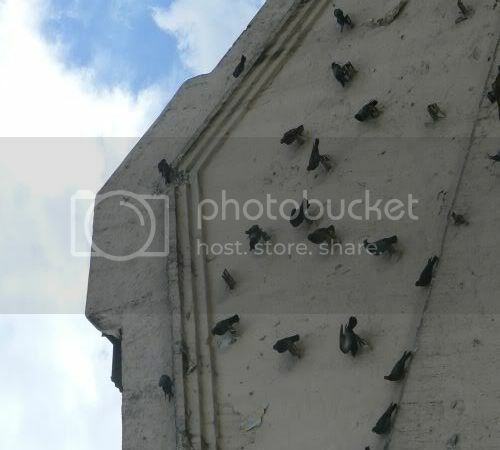 Something interesting I also noticed when I dined here - the pigeons will precariously perch on the wall of Yut Kee at the side as there's these small little iron rods sticking out. I guess they're just looking for a place to chill before it's feeding time. I'm sure quite a few of you know of this place - Al -Marjan in Suria KLCC since it's something not new. In fact, when I googled for other reviews on this restaurant, quite a few hits came back. Anyway, it was my first time visiting the place after hearing a lot about it from Splashie Boy. Located near Chakri Palace and Summer Palace, Al-Marjan brings authentic Lebanese and Persian cuisine to our shores. There's two parts to the place: their main restaurant and a cafe which you can sit outside in the shopping area. You can order the same food if you sit at the cafe area which also serves tea and sweet pastries. Al-Marjan is famous for their buffet especially the lunch one at RM45++ which is great for those who want a speedy lunch since everything is laid out for you. 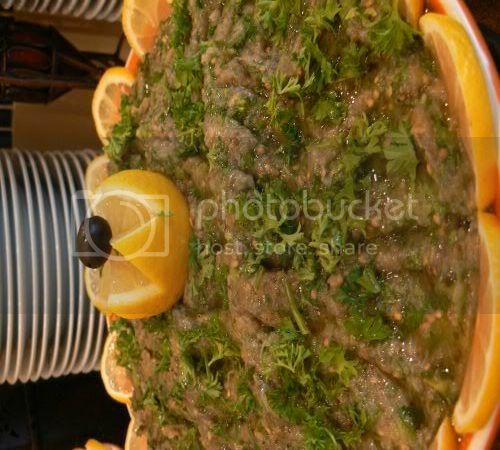 There's a selection of salads, dips, main meals with rice, chicken, meatballs, soups, desserts with fresh fruits, sweet desserts, arabic coffee and drinks. If you don't feel like eating too much, you can choose to have the lighter buffet version at half of the price by eating just their appetisers and desserts. The a la carte menu serves similar items that are available in the buffet such as the hummus, baba ghanoush and etc. 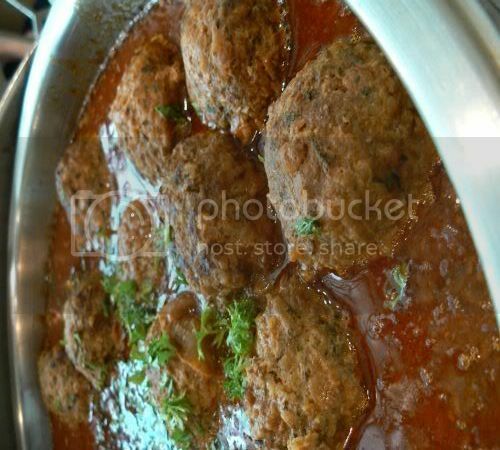 They also have a number of grill items with various types of kebabs, sandwiches with lamb kofta, shish kebab and stews. Unlike Al-Diafah, I prefer the way they serve their pita bread for the dips. It's wrapped up in plastic so it's still soft when you open it to eat. Whereas in Al-Diafah, the bread gets hard quickly as it's left in the open air. I'm perfectly happy to just eat their dips and salads since I love those. Most of the salads are quite simple and tossed in a mixture of just lemon juice and olive oil. 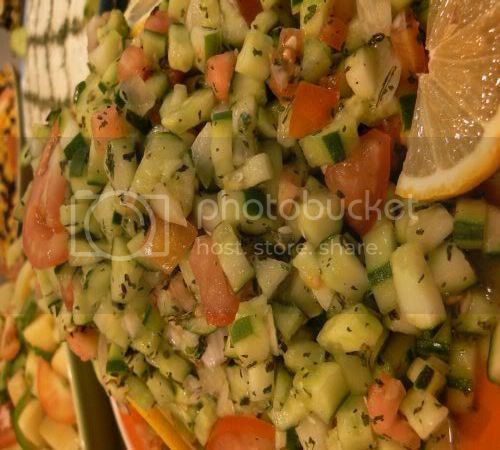 There's a really large selection ranging from Arabian potato salad (boiled potatoes tossed in lemon juice, olive oil and fresh herbs), fattush (it's a combination of fresh vegetables and baked pita bread to add crunch to it) and Salad Shirazi (diced cucumbers, onions and tomatoes). My two favourites are their Hummus mixed with Tahini and Baba Ghanoush made from grilled eggplant. Although I didn't take the meatballs from the buffet, Splashie Boy who has eaten it before swears it's the yummiest around town. They make it extra big here and from minced lamb. If you're not used to gamey meats, it may not be your kind of thing though. 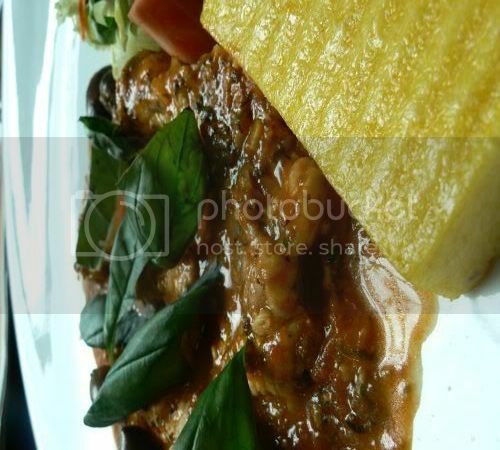 Since Splashie Boy also wanted something light, he ordered their Jujeh Kebab (RM26++) from the a la carte menu. It's basically chicken breast that is marinated in a citrus and saffron marinade. 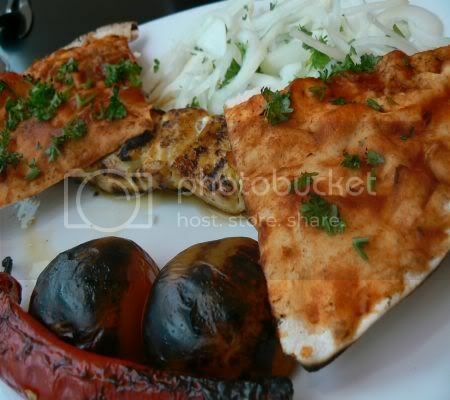 Very juicy and tender, you eat it with grilled vegetables and pita bread. There's all kinds of kebabs on the menu ranging from lamb, fish, prawns and beef. 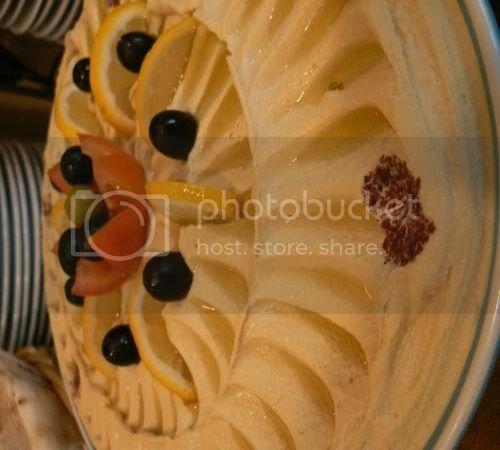 Although they serve a variety of desserts, I zoomed in on the exotic ones such as their Mahlabbiyah. 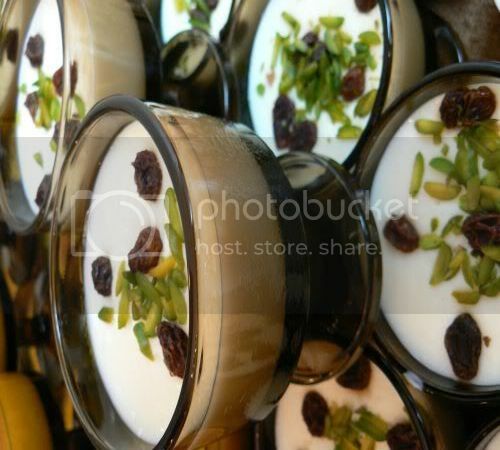 It's made from rosewater, pistachios, raisins, rice, sugar and milk. It was my favourite out of the three they were serving as it wasn't too sweet but deliciously creamy. 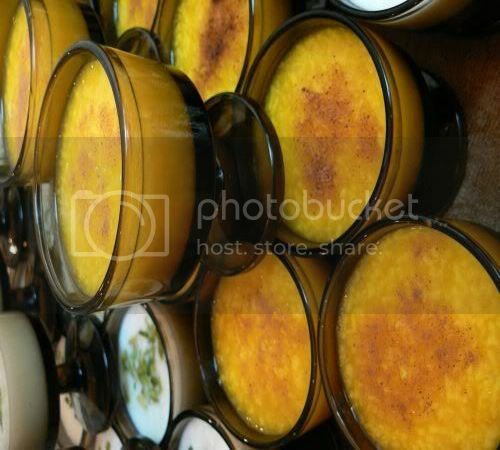 Something eye catching was this Shirberenj which was tinged yellow with saffron and is made from glutinous rice plus sprinkled with cinnamon. 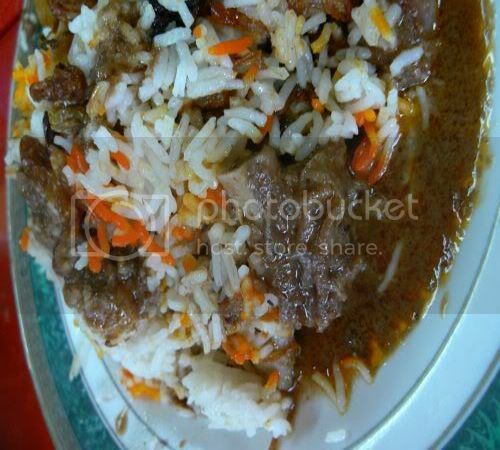 There's also another similar variety made from glutinous rice called Sholezard that is topped with chopped pistachios. I didn't really like the tastes of these two and preferred the sweeter Mahlabbiyah. Besides these desserts, they also serve Arabic Coffee, dried apricots, dates, dry figs, cookies, creme caramel and fresh fruits. Even though I didn't try their mains for the buffet, it looked good with rice and chicken kabsa. It was quite packed with people during lunch and service is brisk here. Definitely a place I don't mind revisiting again to try out more items on the menu or the full buffet spread when I am super hungry.